Tea is the star of the show at Zealong, but lunch and high tea are also served. A Signature High Tea and a Classic High Tea were on the menu for us. Tea is infused in a lot of the small dishes that make up the high tea, including the aromatic mousse in a chocolate cup, and the black tea-brined chicken. I’m not a fan of mascarpone so I doubted it would taste any better infused with tea, turns out it does, for me anyway. It’s obvious a lot of thought has been put into creating the high tea menus and getting the flavours right. 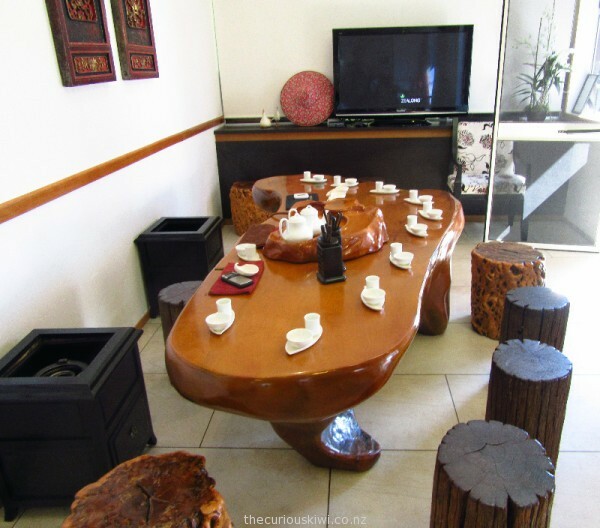 Time and care are also taken with the food presentation and it’s a high tea experience I highly recommend. As someone who drinks milk with a common black tea, it was also a chance to try something new. While I liked the aromatic oolong tea I chose, I suspect cost and habit will keep me shopping for tea in the supermarket aisles. 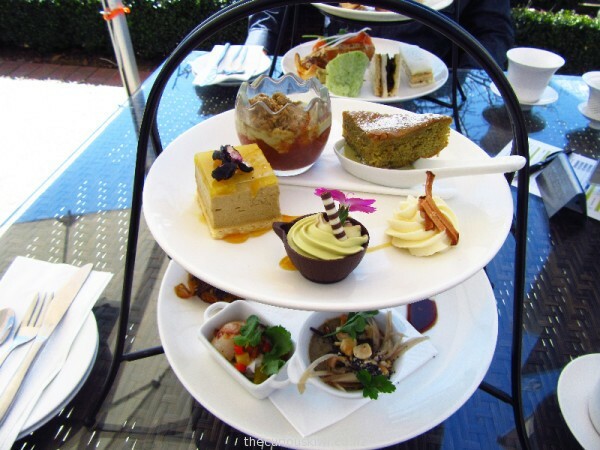 A choice of one of five teas is included in the $42pp high tea charge. 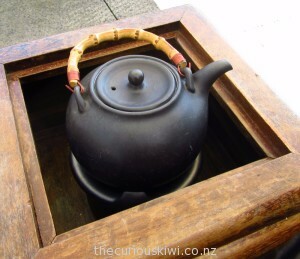 A box with a little heater inside sits next to each table to keep a tea pot of water warm. The green and black teas can be brewed up to four times, the three types of oolong tea, up to eight times. The level of oxidation is the difference between green and black tea, green tea being lightly oxidised, black tea fully oxidised, and oolong tea sitting in the middle between the two and being partially oxidised. 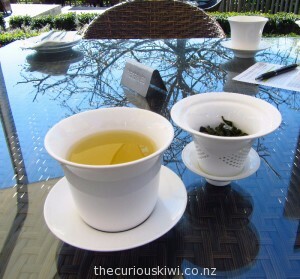 I suspect there is more to it than that though and Zealong offer a Discover Tea Experience for those wanting to find out more. Zealong is open Tuesday – Sunday from 10am – 5pm, closed public holidays. Reservations are recommended. 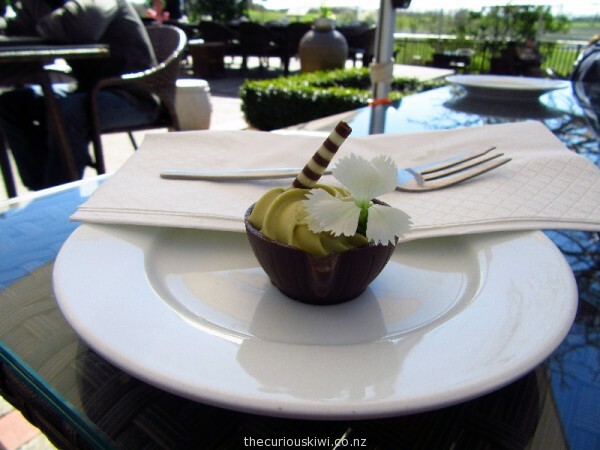 (For more high tea options around New Zealand see High Tea via www.thecuriouskiwi.co.nz). 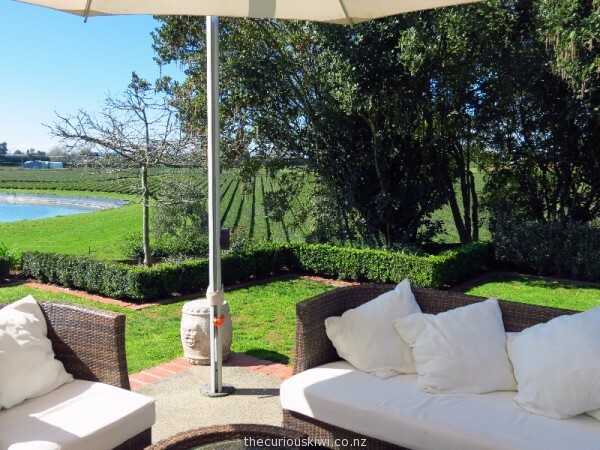 This entry was posted in Eats & Drinks, Unusual Cafes, Unusual New Zealand, Waikato and tagged high tea, unusual cafes, Zealong Tea Estate by thecuriouskiwi. Bookmark the permalink. I hope you worked out this isn’t the place to book for a high tea at Zealong, you need to contact them directly – zealong.com.